They will use the outward facing wall of one of the buildings used as the community room. Here most kids do homework and play the gaming systems available. They will begin this weekend and hope to finish by the beginning of next week. Why the sudden interest to create a mural for this facility? Jeff the founder and owner of Colorado Signs says simply, “ creating signs, murals and the like is my art. This is how I use my creativity and also take care of my family. I want these kids to know that what they imagine they can bring to life. 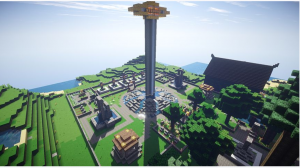 If making villages in MineCraft helps a child to realize his passion for building and engineering than that’s awesome!” We appreciate guys and companies like Jeff’s because they help give back to the community. Not only that but to create a mural based on a game that nurtures creativity sheds some positive light on many kids favorite past time. Gaming! We would also like to encourage those reading this post, that if you have anything you would like to donate to the Boys and Girls club please feel free to stop by or call and arrange a pickup with them. If we all find the positive in things and help take care of our community like Jeff we are that much closer to helping create a positive world.